Ineffective Therapeutic Regimen Management: Pattern of regulating and integrating into daily living a program for treatment of illness and the sequelae of illness that is unsatisfactory for meeting specific health goals. Empowering patients to be active participants in their care plays an important role in the ongoing changes in healthcare. Each patient is challenged with increasingly intricate therapeutic regimens to be managed in the healthcare setting and in the home environment. Moreover, not every patient is able to reach and access healthcare providers and respectively expected to assume responsibility for managing the nuances in their disease. Though many individuals want to be active participants and partners in their own care, patients with sensory perception deficits and altered cognition are not capable of doing so. Also, poverty and the lack of support systems are barriers to accessing health care when needed. Older patients, who often experience these problems, are especially at high risk for ineffective management of the therapeutic plan. Other factors include depression, life crises, unemployment, substance abuse, and other social and emotional problems. Patient verbalizes aim to follow prescribed regimen. Patient exhibits continuous adherence to treatment plan. 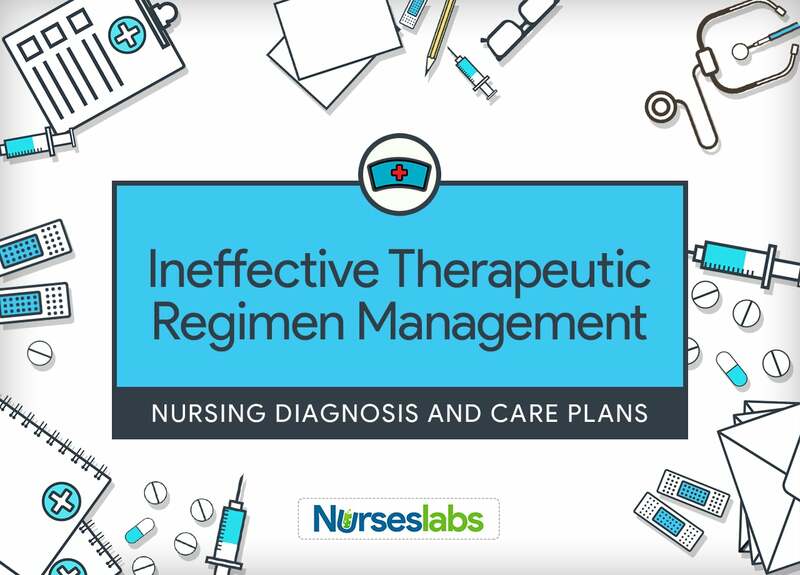 Assessment is required in order to distinguish possible problems that may have lead to Ineffective Therapeutic Regimen Management. Assess for related circumstances that may negatively influence resolution with following the program. Awareness of causative factors provides direction for subsequent intervention. This may range from financial constraints to physical limitations. Assess earlier attempts to follow a regimen. This knowledge presents a great starting point in understanding any complexities in implementation of the treatment plan. Evaluate the patient’s conviction in his or her ability to perform the desired behavior. According to the self-efficacy theory, positive conviction that one can favorably perform a behavior is associated with performance and successful outcome. Evaluate the patient’s individual thoughts of health problems. Based on the Health Belief Model, the patient’s perceived susceptibility to and perceived seriousness and threat of disease influence compliance with the treatment program. Also, factors such as cultural phenomena and heritage can influence how people see their health. Assess the patient’s ability to achieve desired activity. The patient’s ability to conduct the activity determines the amount and type of education that needs to be implemented. Assess the patient’s ability to absorb or recognize the desired health-related activity. Cognitive impairments need to be recognized so a suitable alternative plan can be devised. Once problems are classified, alternative actions can be initiated. Allow patient’s participation in planning the treatment program. Patients who participate in their care have a greater chance of obtaining a positive result. Tell the patient about the advantages of adhering to the prescribed regimen. Patients who understand the effectiveness of the suggested treatment to reduce risk or to promote health are more likely to engage in it. Explain the regimen properly yet easy to understand by the patient. Suggest long-acting medications and eliminate unnecessary medications. Patients are more likely to disregard medications if they are to be taken multiple times daily. Coordinate the therapy to the patient’s lifestyle. This approach promotes compliance. A “one size fits all” is usually ineffective. Avoid unnecessary clinic visits. The physical requirements of going to an appointment, the financial costs incurred (loss of day’s work, child care), the negative feelings of being “talked down to” by healthcare providers not fluent in the patient’s language, as well as the commonly long waits can cause patients to withdraw themselves from follow-ups. Develop with the patient a method of rewards that follow successful follow-through. Rewards may consist of verbal recognition, monetary rewards, special privileges (e.g., earlier office appointment, free parking), or telephone calls. Develop a system for the patient to observe his or her own progress. Self-monitoring is a key component of a successful change in behavior. Explain that side effects or negative side effects of the treatment can be managed or eliminated. This determines if something needs to be revised. Focus on the behavior that will make the greatest contribution to the therapeutic effect. Behavior change is never easy. Efforts should be directed to activities known to result in specific benefits. Initiate referral to a support group if the patient lacks sufficient support system in the following prescribed treatment regimen. Groups that come together for common support and knowledge can be helpful, especially to patients coping with chronic illness. Involve significant others in explanations and teaching. Encourage their support and assistance in following plans. Involving significant others promotes support and assistance in strengthening appropriate behaviors and promoting lifestyle modification.